Art Spiegelman (1948- ) was born in Stockholm, Sweden. In 1951 his family emigrated to USA and he was raised in Queens NY. His early comic work was produced for the American underground comixs of the 1960’s and 70’s, culminating with him co-editing Arcade, The Comics Revue magazine for seven issues between 1975-77 with Bill Griffith in San Francisco. Much of his early work concerned itself with experimenting with the techniques and language of comics rather than a specific plot or narrative, as evident in The Malpractice Suite and Ace Hole, Midget Detective. However, the Arcade experience was such that he vowed never again to edit another magazine. In the early 1990’s, Tina Brown became editor of The New Yorker magazine with a mission to update the magazine’s image. One of the first artists she wanted to produce the cover was Art Spiegelman. He began to contribute covers as well as short comic works and by doing so earned himself a reputation for generating controversy. During his long career, he has also worked for the Topps Bubblegum Company between 1966 and 1989, designing the famous Garbage Pail Kids and Wacky Packages bubble gum cards, before finally leaving over a dispute over the return of art work to himself and the artists he had encouraged to also work for them. He has taught history and aesthetics of comics at New York ‘s School of Visual Arts. He has co-edited with Francois Mouly, the series of RAW One Shot books and was the series designer for the Avon Neon Lit line of graphic novels which included the acclaimed adaptation of Paul Auster’s City of Glass by David Mazzucchelli. He lives in Manhattan, NY with his wife, Francoise Mouly and their two children. 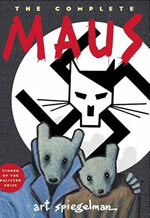 Maus tells two powerful stories. The first is of Valdek Spiegelman, a Jewish survivor of Hitler’s Europe, in a harrowing tale filled with countless brushes with death, improbable escapes, and the terror of confinement and betrayal. The second is of his son, a cartoonist, trying to come to terms with his father and his terrifying past, as together they try to lead a normal life in New York - a life of minor arguments and passing visits. It is a survivor’s tale and a tale of how the children survive the survivors. Making comics worked out cheaper than paying for therapy to deal with his parents’ survival of the Holocaust and his own survival of his fraught family life. The almost 300-page Complete Maus took him more than a decade but changed the way people view comics, or graphic novels, forever. It also changed Spiegelman from an obscure avant-garde cartoonist who was finding himself “speaking to fewer and fewer people” into a Pulitzer prize-winning celebrity. 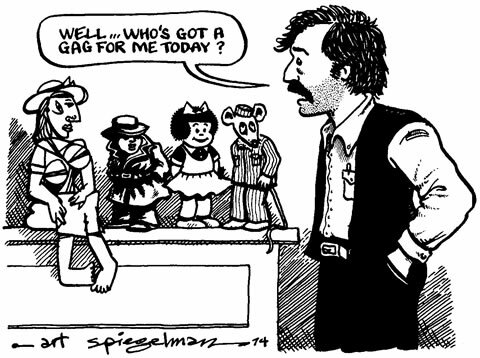 Since discovering his work in the mid 70s, I have been convinced that Art Spiegelman is perhaps the single most important comic creator working within the field and in my opinion Maus represents his most accomplished work to date… Intensely subjective, it manages to encompass subjects as sensitive and diverse as the holocaust on one hand and the yawning emotional gulf between parents and children on the other, all in a fashion that is at once revealing, moving and innovatory. Maus surely marks one of the high points of the comic medium to date. It is perhaps the first genuine graphic novel in recent times, and as such its significance cannot be overstated. Please read it. 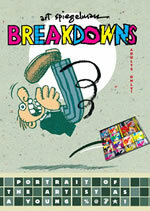 This year as he turns 60 brings a reprint of Breakdowns, a 1977 hardback collecting and enlarging thirteen strips of one to eight pages from before Maus. Its title suggests both the author’s mental crises and those sketchy preliminary stagings of a comic. Among them is a 1972 prototype of Maus, three pages created when he was 24 for Funny Aminals [sic], an underground comic subverting the funny animal genre’s traditional innocence. Those Jewish mice and Nazi cats, a cutaway diagram and father’s distinctive voiceover are all here in embryo but over-rendered in an imitation of Robert Crumb’s Fritz the Cat style, the mice’s enlarged, weepy Margaret Keane eyes trying too hard to make us emote. Part of what gave the later full-length Maus such impact is the understated directness which Spiegelman arrived at in its drawing and narrative. This apparent simplicity contrasts with many of the other early efforts in Breakdowns which reveal his penchant for density, deconstruction, experimentation, theorising and High/Low quotation, from cut-up collage in Malpractice Suite to Picasso-meets-Chandler in Ace Hole, Midget Detective. Ahead of their time, these knowing exercises flew over the heads of most of his peers, whereas today they can be seen as anticipating the current cutting-edge. Alan Moore and Chris Ware cite them as inspiring their work’s multi-path, multi-track sophistication which is now almost taken for granted. Spiegelman’s 1970s work also provides him with the formal grid, five storeys of three identical panels, and the building blocks - recurring elements, techniques and characters - for the book’s new 19-page introduction. He has separated this into combinations of orange and greenish blue, reminiscent of the two-colour 3D process which Spiegelman, virtually blind in his left eye, can never perceive. Just as our memories are fluid, his twenty-two autobiographical vignettes shift in time and style to recreate moments that have shaped and misshaped him. On 11 September 2001, Art Spiegelman raced to the World Trade Center, not knowing if his daughter Nadja was alive or dead. Once she was found safe - in her school at the foot of the burning towers - he returned home to meditate on the trauma. “I hadn’t anticipated that the hijackings of September 11 would themselves be hijacked by the Bush cabal that reduced it all to a war recruitment poster…” In his first graphic novel since the groundbreaking Maus, Art Spiegelman presents a deeply moving personal, politically charged account of the events and aftermath of September 11, 2001. 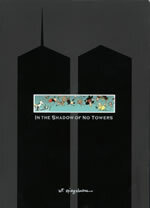 In a large format book, Spiegelman relates his experiences of the national tragedy in drawings and text that convey the unfathomable enormity of the event itself, the obvious and insidious effects it had on his life, and the extraordinary and often hidden changes that have been enacted in the name of post-9/11 national security and that have begun to undermine the very foundation of American democracy.